This abuse-taking, World Cup-ready DH 6061 Aluminum Butted frame with 27.5-inch wheels is built with a speedy geometry and Kona's own Beamer Independent Suspension. This suspension system lets the Supreme Operator stay higher in the travel and recover from hits more quickly. 12x157mm rear dropouts give this race machine a stiff rear axle and plenty of tire clearance. This Kona Supreme Operator is ready to be rolled straight to the start gate. 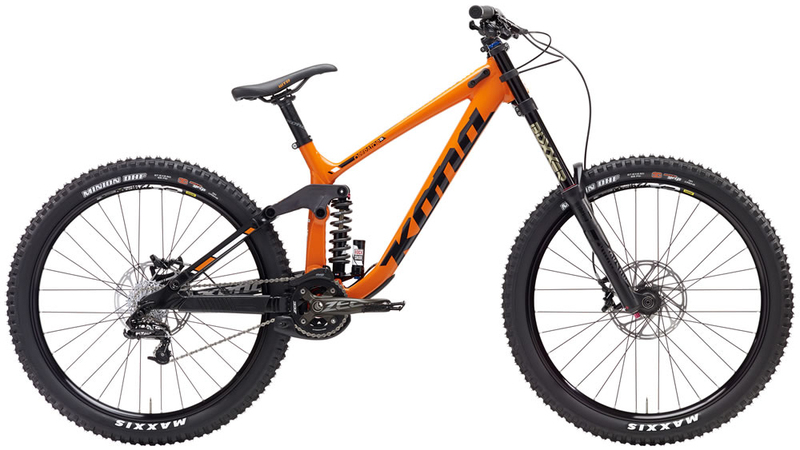 The Kona Operator AL/DL is an incredible bike with a durable build kit. Experience an amazing ride without spending the couple extra grand for a carbon frame. A Rock Shox Boxxer RC fork and Rock Shox Kage RC rear shock provides a supple and smooth ride, the SRAM GX drivetrain provides all the gears you need to sprint to the finsih, and Guide R brakes provide incredible stopping power when descending those steep chutes. Maxxis Minion DHF 3C 27.5x2.5"